For the earthquake of 16 August 2013, see 2013 Lake Grassmere earthquake. The 2013 Seddon earthquake measured 6.5 on the Mww scale and was centred in New Zealand's Cook Strait, around 20 kilometres (12 mi) east o |date = 21 July 2013 (2013-07-21)f the town of Seddon in Marlborough. The earthquake struck at 5:09:30 pm on Sunday 21 July 2013 (05:09 UTC) at a depth of 13 kilometres (8 mi), according to Geonet. The United States Geological Survey also measured the quake at 6.5, at a depth of 17 kilometres (11 mi). The quake caused moderate damage in the wider Marlborough area and Wellington, the nation's capital city 55 kilometres (34 mi) north of the epicentre. Only minor injuries were reported. Several aftershocks occurred during 21–29 July. 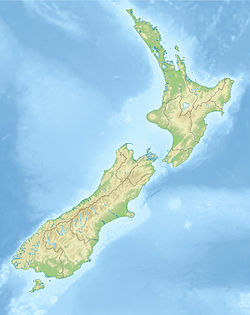 The Seddon earthquake is considered the first of an earthquake doublet, with a second earthquake of similar magnitude occurring on 16 August 2013. The earthquake was preceded by a series of foreshocks, the largest of which had a magnitude of 5.7. Below is a list of all foreshocks magnitudes 5.0 and above that occurred in the region between 19 July 2013 and 21 July 2013. The earthquake generated a series of aftershocks, the largest of which had a magnitude of 5.4. Below is a list of all aftershocks magnitudes 5.0 and above that occurred in the region between 21 July 2013 and 2 August 2013. The quake resulted in varying degrees of damage to thirty-five buildings within the Wellington CBD with glass from broken windows falling onto the main thoroughfares of Lambton Quay, Featherston Street, and Willis Street. Damage was also caused in Paraparaumu, Wainuiomata, Porirua and the Hutt Valley in the North Island. The Wellington Region emergency management office was activated on the evening of 21 July, as were those in the lower part of the North Island. On 22 July parts of Wellington's central business district were closed to the public to allow for inspections to buildings with damaged and potentially dangerous façades. Four people were injured in the quake, which lasted for 20 seconds, blowing out windows, cracking concrete and swaying buildings. ^ a b "Wellington earthquake: We can afford new quake damage - PM". The New Zealand Herald. 22 July 2013. Archived from the original on 22 July 2013. Retrieved 22 July 2013. ^ "Quakes". GeoNet. Retrieved 21 July 2013. ^ "M6.5 - 46km ESE of Blenheim, New Zealand". USGS. Retrieved 21 July 2013. ^ a b "M5.5 - 34km E of Blenheim, New Zealand". earthquake.usgs.gov. Retrieved 2015-12-11. ^ "GeoNet - Quakes". www.geonet.org.nz. Retrieved 2015-12-11. ^ a b "M5.9 - 35km ESE of Blenheim, New Zealand". earthquake.usgs.gov. Retrieved 2015-12-11. ^ a b "M6.5 - 46km ESE of Blenheim, New Zealand". earthquake.usgs.gov. Retrieved 2015-12-11. ^ "M5.3 - Cook Strait, New Zealand". earthquake.usgs.gov. Retrieved 2015-12-11. ^ "M4.9 - 34km SE of Blenheim, New Zealand". earthquake.usgs.gov. Retrieved 2015-12-11. ^ "M4.7 - 39km SE of Blenheim, New Zealand". earthquake.usgs.gov. Retrieved 2015-12-11. ^ a b "Severe quake rocks North and South Island". The New Zealand Herald. 21 July 2013. Archived from the original on 22 July 2013. Retrieved 22 July 2013. ^ Quilliam, Rebecca (22 July 2013). "Wellington earthquake: 35 buildings damaged in CBD". www.nzherald.co.nz. Archived from the original on 23 July 2013. Retrieved 23 July 2013. ^ "Wellington earthquake: What you need to know". The New Zealand Herald. 22 July 2013. Archived from the original on 22 July 2013. Retrieved 22 July 2013.